EV 01 Thickness gauge series are special thickness gauges, with the possibility of many different applications, measuring foot and table. Digital Gauge modified for correct measuring pressure for rubber, plastic or textile testing, including 10 mm gauge block, lifting cable, measuring foot and weight for thickness measurements. Stand, of stable construction, with the possibility of fine adjustments of the height. 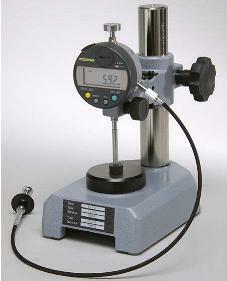 Software EC 02 for thickness measurements and Compression Set for PC-Computers. The program permits storage of the results on a disk and printing of the results together with trend graph and statistics (optional).